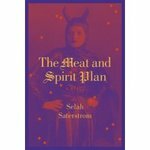 Saterstrom's book can be classified in the "coming of age" category. It's somewhat a The Catcher in the Rye meets Virginia Woolf wild ride. Really brilliant, really dark and with a sharp southern accent, it caught me completely by surprise. It's a challenging read, definitely not of the "feel good" variety. In fact, its power lies in its fury. A powerful statement on going from adolescence to adulthood in the 21st century. 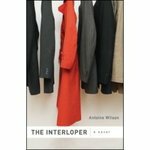 Another book that completely blindsided me, I don't recall how I first heard about The Interloper. I didn't receive a review copy. I found a written review of the book somewhere or other and requested a library copy, instead. This is a book that sneaks up on you. It starts out simply enough. Owen Patterson desperately wants to break his wife out of the depression that's gripped her since the death of her brother, but she seems intent on holding onto the grief. As the story unwinds the reader starts to realize all isn't well with Owen, either. Then starts the downward spiral. A gripping read. Two great books - your reviews/interview of Saterstrom reminded me I had her two gems in my piles and I searched them out and loved them - thanx!